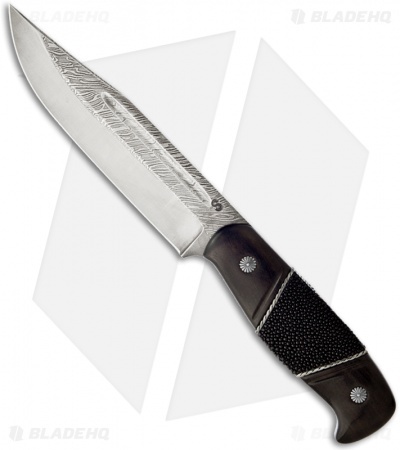 The Voykar Elite knife from Olamic Cutlery features a Damascus weld-on W1 tool steel clip point blade. The handle has Ebony wood scales and a rayskin inserts along with silver pin caps and silver plated wire. The Voykar Elite fixed blade comes with a premium brown leather sheath. Olamic Cutlery was founded in 2010 by Eugene Solomonik and his father. 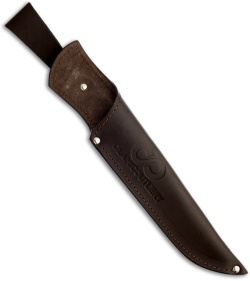 The knives are handmade in a small shop in Russia and are each stamped with serial number. The four craftmen are trained specifically in their respective areas: blade forging and shaping; heat treatment and acid etching; final assembly and handle work. Each knife comes with a signed Certificate of Authenticity and transferable lifetime warranty.